When to choose a country-specific domain extension? Before teaching you how to choose a domain name, I will first explain what a domain name is. A domain name is the human-readable address of a website. Without a domain name, a website would only be an IP address. In this case, “antreno.com” is called a domain name and the “.com” part singularly, is called the domain name extension. That is called a subdomain. A subdomain is only a subdivision of a domain name and all the domains can have subdomains. Choosing a domain name for your blog is an essential step in your blog creation process. Once you choose a domain name, that will become your identity for as long as your blog exists. Note that once registered, you cannot change your domain name. The only way of changing your domain name is to register a new domain name and then set the new domain nameservers’ to your hosting company’s nameservers. I won’t get into details about this since it’s out of the scope of the current post. Whatever you try to sell or promote, your domain name will affect your brand’s image. The domain name is very influential, and that’s the reason why a few companies have changed over time their brand name into the name of their domain names. I will assume that you want to start a website exclusively for blogging, but you can also apply some of the tricks below for choosing a brandable domain name for your company. I’ve been in a dilemma for quite some time whether to choose a domain name with my name or a brandable domain name. Many successful bloggers in my niche have built a brand around their names. and the list can continue on an on. The second category of domains are the brandable domain names. The third category of domains are the exact match domain names. Let’s dissect all the domain formats mentioned above and mention the advantages and the downsides of each type. If you intend to have a blog where you want to be seen as the expert (like a consultant) in a particular field, choosing the domain name based on your real name is not a bad idea. There are a lot of very successful bloggers who have built large brands around their name, and I have to admit that I was also tempted to choose my personal name as the domain name. First, the exact domain mariusenache.com was already taken. The .net extension was available, and I have even registered it but didn’t do anything with it for a year, and I let it expire. I will explain later in this article why I prefer a domain name with the .com extension instead of another extension. The second problem was that my target audience is the people in the USA, and my full name is not easy to remember or to be pronounced in plain English since it’s not a name with origins from English speaking countries. Even though this type of domain names are excellent for personal branding, these domain names will decrease the selling price of your website if you ever decide to sell your blog. The chances to find a buyer interested in your niche and who has the same name as you are minimal. In my case, almost null. A brandable domain name is a great fit for individuals or companies. If you choose a general domain name that doesn’t have any meaning, you can use it in any niche. However, if you register something like antrenomarketing.com, then you’ll have to use your domain for a website related to marketing. Even though initially I wanted to register a domain name with my personal name, I ended up registering antreno.com, and I think it was the right decision now. If you want to register a brandable domain name, make sure you take into consideration the location of where your site will receive the most traffic from. Since my focus is on the traffic from the English speaking countries, I had to find something that sounds good in English. A website with a brandable domain name should have a higher selling price than a domain name with creator’s personal name as the domain name (of course, assuming both sites have the same content and traffic). The exact domain names were very popular in the past when it was effortless to rank in the search engines with an exact match domain name. In the present, because there are less and less good exact match domain names available to register and because Google’s search algorithms do not rely very much anymore on site’s domain name, the number of these domain names is in decline. These domain names are very general and usually not easy to remember by the visitors. Because these names are made of keywords, these often have many characters in theirs componence. I used to have a few exact domain names in the past, but I’m not a big fan of this type of domains anymore. So, I prefer the brandable domain names, but depending on your circumstances and the purpose of your domain, you might want to choose your personal name as the domain name or an exact match domain name. While Google might have treated the domain names differently in the past based on the domain extension, today Google representants say that they treat the domain extensions equally (except the international domain extensions). These are called Global Top-Level Domains (gTLD) and are the oldest domain extensions available for registration to the public. The “.com” is a generic top-level domain, and its name is derived from the word “commercial.” The .com extension has currently the largest number of domain names registered. Since finding a proper gTLD available was becoming harder and harder, in the recent years, besides the country specific domain extensions, hundred of other domain name extensions have been added. These extensions are designed to cover various fields and industries. Even though you can now choose between hundreds of domain extensions, I still recommend you to try finding a .com domain name available before looking for the other extensions. All those who seek to lay the foundation of an international brand are looking to register a .com domain name. Even though the new companies have started to slowly adopt the new extensions, the big companies are still looking to own the .com domain. There are a few advantages of owning the .com. A domain name with a .com extension is the easiest to remember by a customer. If a client won’t remember the exact URL of your site, the probability is greater that he will first try to access yourcompany.com instead yourcompany.net, yourcompany.org, yourcompany.cool or yourcompany.business. If you want to promote your company/product locally in a particular country, go for a domain name with your country extension. Even if you are looking for a domain name for your brand, or you are looking for a domain name that will contain your wanted keywords, stay away from too long domain names. In general domain names can be up to 63 characters long, but I do not recommend you to choose a domain name above 25 characters. A very long domain name will leave a feeling of unprofessionalism to your customers or visitors and will also be very hard to remember. Because of this, you can lose confidence, traffic, and potential customers. Do not imagine that if you choose a domain name that contains 10 keywords will do better in search engine results. As I already mentioned above in this article, in the past, the search engines were paying more attention to the keywords within the domain name, but nowadays, their algorithms have changed dramatically in the attempt to reduce spam sites and promote only those that offer high-quality content. Just because a domain name is keyword rich does not necessarily mean that it will be displayed on the first page of search engine results. Hyphenated domain names can hurt the traffic of your site. People usually get confused with the dash, and they often forget to add it when accessing the URL directly. Although they are easier to read, SEO experts said that domain names containing hyphens were harder to rank in the search engines (I don’t know if that still applies because I only had a single domain name with a hyphen in the title, and that was a few years ago). Use of hyphens also correlates highly with spammy websites. Hyphens detract from credibility and can act as a spam indicator. However, if the domain without a hyphen is not available and you yet choose to register a hyphenated domain name, make sure that you won’t use more than a hyphen. Your site visitors will often forget about adding the hyphens when they type the site URL, and your website will lose traffic. So, if you want an SEO friendly and professional looking domain name, I wouldn’t advise you to register a domain name that contains hyphens. Whenever I start a new site, I usually spend a few days only to search for a domain name that I like. Many of the good domain names are already registered by companies that resell them for high prices and that make my task of finding the proper domain name harder. There are a few online domain name generators that you can use for finding a domain name. Most of these sites can generate a domain name from two or three words you provide, will combine the letters of these words in many different ways, add prefixes, etc. If I already have a potential domain name in my mind, but the domain name is already registered, then I try to find synonyms for the words in the componence of the domain name. For example, let’s assume I want the domain: bestproductreviews.com, which is already registered. I divide the domain name into three words: best, product, and reviews. Then I try to find synonyms for these three words. One website that helps me with finding synonyms is Google Translate. I set the language to English and the other language to my first language, which is Romanian. 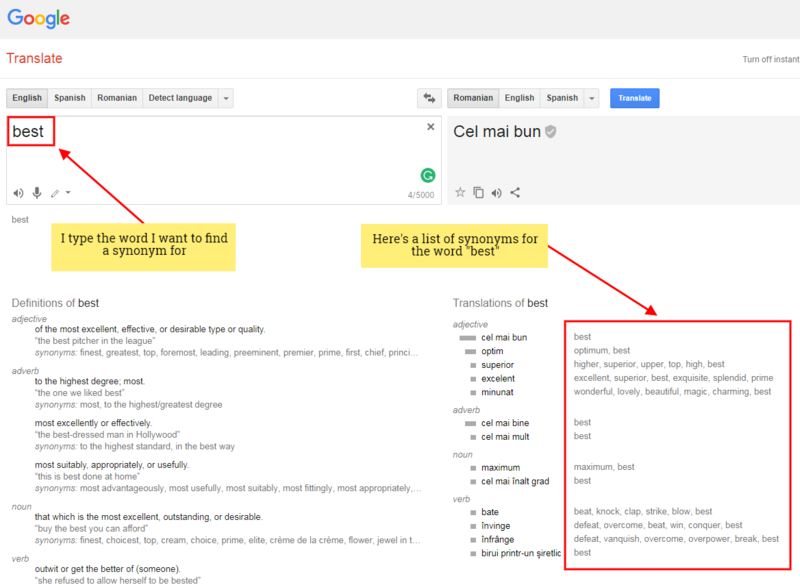 I then type a word in the translation box and on the bottom-right side of the page, Google Translate will display a list of synonyms for the chosen word. If I find a word I like, I take that and substitute it in the initial domain name and check if the domain name is available. And I can repeat the process for every word in my domain name. Choosing a domain name is an essential step in starting a successful blog or presentation site. A domain name will become your virtual home, and it’s the name that your visitors should easily remind when they want to revisit your site. In time, the name of your domain name will become representative for you and for your company. You can choose your domain name based on your site’s niche, company or personal name, or just find a general brandable domain name that can fit any niche. Take your time for finding the right domain name and take into account the tips given in this article. Now that you know how to choose a domain name, you can advance to registering your domain name.